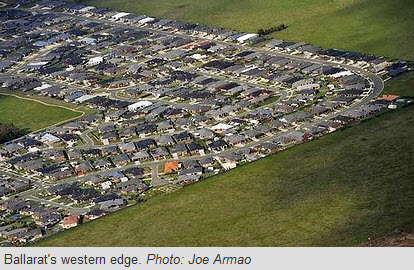 Where does Melbourne end (and sprawl begin)? Drive out towards Warburton and it seems easy to see where Melbourne ends and rural life begins. One minute you’re driving through houses, shops and businesses, when all of a sudden you’ve arrived in country. Except you’re actually still in Melbourne because the official boundary of the metropolitan area lies on the other (eastern) side of Warburton! People seem to like a hard edge – a clear and unambiguous boundary – between city and country. But it only works if the non-developed land is “pure” bush or bucolic farming land, without service stations, hobby farms or other urban detritus. Head out of Melbourne in most other directions and development – almost all of it tacky and ugly – tracks you like a mangy dog. 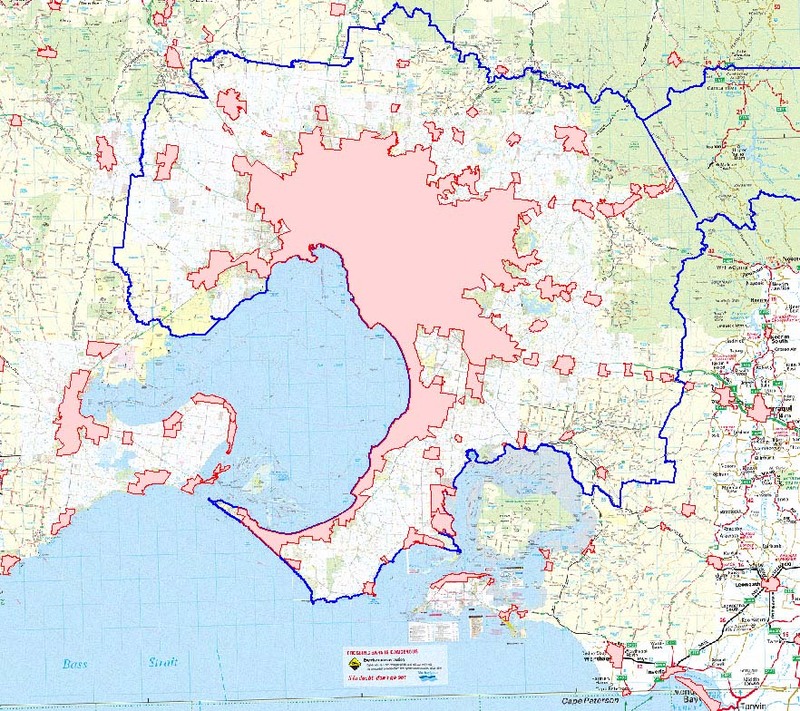 The continuous built-up area of Melbourne (the pink bit in the middle of the map) occupies less than 2,000 km2. This is much less than is commonly assumed by the media and is just a little more than a quarter of the area covered by the official or administrative boundary, which is 7,672 km2. There are a number of “islands” of development within the boundary (also shown in pink), like the townships of Melton and Sunbury, that are officially part of the metropolitan area but separated from “mainland Melbourne” by green wedges. It makes sense to count a place like Melton township as part of Melbourne because 65% of workers living there travel across 9 km of green wedge to work in mainland Melbourne. These islands make discussions about sprawl particularly fraught. Is it just the central core of continuous urbanised development that sprawls or should all the islands within the boundary also be included? If they are, then that not only includes towns such as Melton, Sunbury and Pakenham, but also towns like Warburton, Healesville and Gembrook that appear to the first-time visitor to be country towns. And given that island townships like Garfield and Bunyip in the outer south-east corridor are officially part of Melbourne, it’s reasonable to wonder why towns that lie just outside the boundary, like Drouin and Warragul, aren’t also seen as part of Melbourne’s sprawl. Are apartments the answer to ‘McMansions’? Demonising sprawl seems to be the mission of many planners, academics and journalists, but oftentimes zealotry leads to mistakes, as with this claim that infrastructure costs on the fringe are double those in established suburbs. I’m reminded again how easy it is to get the wrong end of the stick on this issue by a study released last week by the Architecture Faculty at Melbourne University. The University’s media release tells us the study found “houses on Melbourne’s suburban fringe are responsible for drastically higher levels of greenhouse gas emissions compared to higher density housing or apartments in the inner city”. The Age ran with the media release, reporting that bigger dwellings and more car-based travel are the key reasons fringe houses consume more energy and emit more greenhouse gas than apartments. I can’t refer you to a full copy of the study because the University didn’t make it available to the media or the public. That didn’t seem to worry The Age, but I think it’s an extraordinary decision – does the University exist to issue media releases or to undertake serious research? I contacted one of the authors who told me the study is a journal article and he couldn’t give it to me for copyright reasons. He gave me this link to the abstract. I’ve read the full article but if you don’t have on-line access you’ll have to spring for €35 if you want to read it. 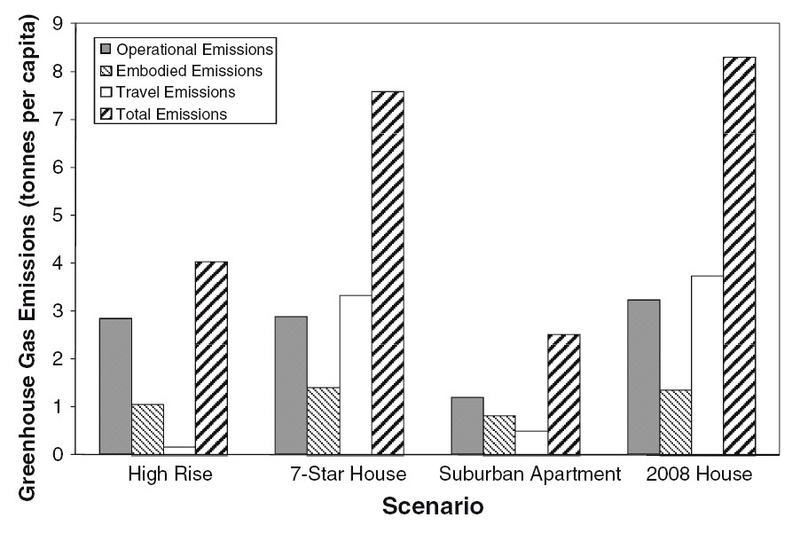 A key part of the study is a comparison of the (embodied, operating and transport) energy consumption and greenhouse gas emissions of households in three building types – a 100 m2 two bedroom high-rise apartment in Docklands 2 km from the city centre; a 64 m2 two bedroom suburban apartment 4 km from the centre in Windsor; and a 238 m2 detached house in an outer suburban greenfield development 37 km from the centre (the latter is shown in the accompanying chart in two versions – a 2008 five star and a “future” seven star energy rated version). I don’t know what the point of this sort of comparison is. Putting transport aside (you’ll see why later), there’s little policy value in comparing a $1 million plus Docklands apartment with a $500,000 plus suburban apartment in Windsor, much less comparing both with a $350,000 house and land package on the urban fringe (and I’d say Windsor is inner city!). Nor does a seven square two bedroom apartment seem like a practical substitute for the sort of household that buys a 26 square four bedroom house. A better approach would’ve been to compare the greenfield house against a townhouse of similar value located in the established suburbs, say 20 km or more from the centre (or perhaps against a greenfield townhouse set within a walkable neighbourhood). Alternatively, the authors could have followed the ACF’s lead and compared the resource use of all suburban residents with those of inner city residents – but the catch here is the ACF found that, even though on average they live in smaller dwellings, inner city residents have a higher ecological footprint (see here and here)! Why is road pricing a good idea? What Americans mean by a 'McMansion'. Click for slideshow. I’m not aware of anyone who disagrees seriously with the contention that car travel is underpriced. The consequence of this inefficiency is we drive more than we otherwise would and more than is socially optimal. The idea of road pricing is that drivers should pay the real costs they impose on others through traffic congestion, pollution, noise and carbon emissions. There’s also another force at play here which exacerbates the problem of excessive driving. There are some costs that drivers actually do pay – standing costs like depreciation, insurance and registration – that are “disconnected” from the perceived cost of travel. A person deciding whether or not to drive somewhere will tend to take account of the cost of their time plus petrol, but they usually don’t perceive the standing costs. This under-estimation promotes more driving. There have been various experiments with road pricing, such as the well known Singapore and London central city cordons (giving rise to amusing interpretations such as this one by Boris Johnson). However this is a technologically outdated approach – transponders and/or GIS technology mean it is now feasible to charge motorists in relation both to distance and traffic conditions i.e by location and time. A driver who paid a price for a litre of petrol that included both external and standing costs would have a strong incentive to drive less. A gauge on the dash showing the total cost ticking over with every kilometre would provide an even more powerful nudge to think long and hard about the wisdom of driving. Road pricing can be thought of in simple terms as a two-part per kilometre tariff that recovers both external costs and those standing costs that can be disaggregated. One part is a charge reflecting the general cost of using the roads. The other is a variable price reflecting specific costs like congestion in peak periods. One argument against suburban sprawl is that it sterilises agricultural land. A particular variation on this contention is that land should be preserved for agriculture so that carbon emissions in transporting food from farm gate to plate – “food kilometres” – can be minimised. A frequently cited estimate is that food in the US travels on average 2,400 km from where it is produced to where it sold to consumers. We should therefore seek to grow as wide a range of food as possible as close to Melbourne as possible. All things being equal that makes sense. But of course it’s never that simple. Here are some pertinent issues to consider. First, transport is not a major component of the total carbon emissions from agriculture. 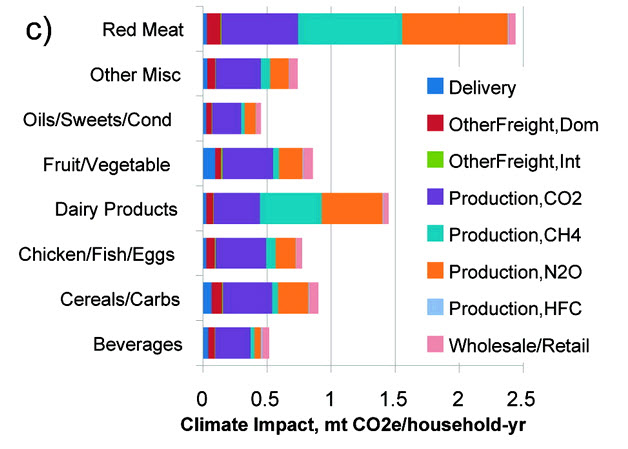 These researchers estimate that on-farm production accounts for 83% of the average US household’s carbon emissions from food whereas delivery from producer to retail outlets accounts for just 4%. Are new outer suburban homes getting smaller? There was a flurry of almost salacious excitement in the media at the end of last year when an ABS study found that Australians have the largest homes in the world. Worse, it found Victorians have the biggest homes in the country. “While Australian home sizes have risen 10 per cent over the past decade, research shows sizes of new American homes have fallen from a peak of 212 square metres to 201.5 square metres”. Now property group Oliver Hume has thrown some new light on home sizes in Melbourne. They say that excluding Melbourne’s west, the median size of homes in the other five growth areas actually fell slightly over the last three years. 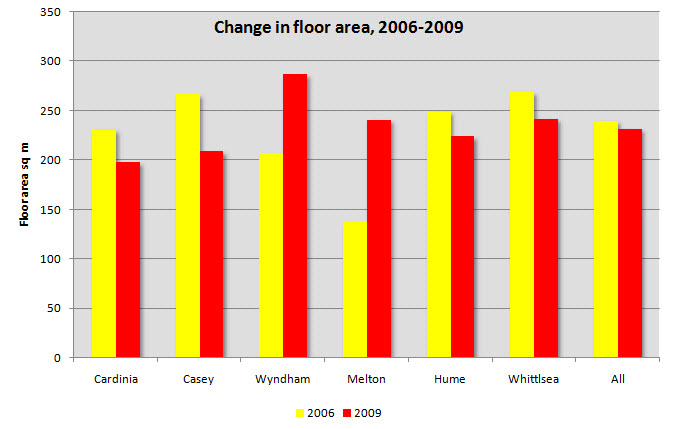 The largest absolute fall was in Cardinia, where the median home size fell from 267 sq m to 209 sq m, or by 57 sq m. Home sizes also fell in Casey, Hume and Whittlesea but increased in Wyndham and Melton. This does not, however, indicate an across-the-board change in preferences toward smaller houses. Will Brumby’s new decentralisation initiative work? The Ready for Tomorrow initiative announced by the Premier earlier this week is being sold as a way to relieve growth pressure on Melbourne. Just why people would move to regional centres on a scale sufficient to ease the demands on Melbourne significantly is not clear, as there’s little in the announcement to suggest the Government has suddenly discovered the secret to growing jobs in the regions. The track record of policy-driven migration in Australia is poor. The decentralisation schemes of the seventies, based on growing regional centres like Albury-Wodonga and Bathurst-Orange, were conspicuously unsuccessful in lowering growth in the major capital cities. Decentralisation was supposed to be driven by manufacturing, which at that time was on the march out of the inner city. However rather than moving to regional centres, manufacturing largely moved to the suburbs and offshore. It now offers even less potential for underpinning decentralisation that it did 30 or 40 years ago. I think the practical impact of Ready for Tomorrow is more likely to lie in enhancing the liveability of the regions than in giving respite to Melbourne. It is really a regional development program. As The Age’s editorial writer points out, even if the annual growth rates of the eight largest regional cities were to double, it would only relieve Melbourne of seven weeks growth.